Looking for a special gift for the farmer in your life? 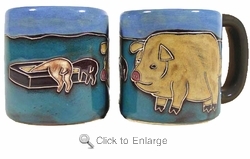 This Mara Pigs Stoneware Coffee Mug is one such gift. It shows a pig and also pigs at a trough.